Crescent shaped. 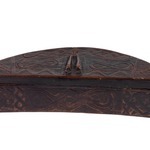 The boxes shaped like a crescent or a half-moon have, most of them, been used to contain the red camwood pigment .All the boxes of whatever shape were used either for this purpose or for the safekeeping of small objects. 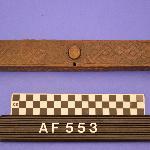 The five branched deisgn in the middle of the lid represents a harp. The zizzag lines on each side of this are called bisha ngila wild cat's back. The biscected lozenges are pasi, cowries. On the convex edge of the lid is seen nyinga, smoke (or lukata), on the concave edge, two forms of namba, knot. The convex side of the box shoes imbolo, a simple basket weave, and shamba, chequer weave; the concave side has tamberi koko, fowl's feet, bisha ngila and shamba. Bushongo, Kasai- Sankuru River, Southwestern Belgian Congo.